Last night, we attended the dress rehearsal of Living With…, an original production about the experiences of an intergenerational group of people living with HIV performed by people living with the virus opening tonight at New York University’s Black Box Theatre. 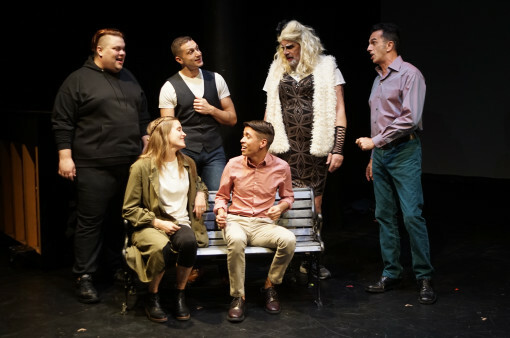 Presented by the Theatre & Health Lab of NYU’s Program in Drama Therapy, the play explored what it’s like to live with HIV in 2018 and was based on the experiences of four long-term survivors and three individuals diagnosed in more recent years. Drama therapy employs theater techniques to promote personal health and wellness. Living With… was created as part of the school’s As Performance series, which creates partnerships with professional drama therapists, playwrights and community organizations to create theater with real people about their real lives. Living With… got its start back in April, with a casting call for individuals living with HIV interested in participating in a support group and theater-making project about their experiences. The group met once a month with playwright Joe Salvatore and director Nick Brunner. Their shared stories subsequently became the basis for portions of the play; each member also wrote a monologue for the production. Ed Barron (2015 POZ 100 honoree) and Enrique Menendez (2018 POZ 100 honoree) were part of the cast. As long-term survivors, they shared the history of the AIDS crisis and activist movements with the younger members of the production. At the start of the performance, director Brunner asked audience members to take a moment, with their hand on their chests, to express self-care and open up their hearts to give the performers the space to tell their stories. He warned that some of the stories might not be easy to hear or even be triggering for some individuals, as they referenced sexual violence and suicide. The collective experience set the stage for the healing we were about to witness in the minimal theater space, which served as the perfect backdrop for the raw, emotional and, at times, funny performances that unfolded before us. Broadway-worthy musical numbers, written by composer and cast member Brent Wakelin helped string together disparate vignettes and monologues that incorporated movement and screen projections. HIV-related themes explored by the performers included stigma, isolation, fear, treatment issues, drug use and mother-to-child transmission. Although each scene could have stood on its own, as one coherent piece, the production emphasized connection and community while at the same time allowing individuals to have their own moment of catharsis. So in honor of World AIDS Day, we encourage you to find your safe space, accept and take care of yourself and find the time to listen to one another’s stories—and if you’re in New York, to take time to listen to the stories shared in Living With…. Living With… will be performed at the Black Box Theatre on Wednesday, November 28 to Friday, November 30 at 8 p.m. and Saturday, December 1 to Sunday, December 2 at 3 p.m.
Black Box Theatre is located at 82 Washington Square East. For tickets ($15 general, $5 for students and seniors), visit tickets.nyu.edu, call 212-998-4941, or visit the NYU Box Office in person at 566 LaGuardia Place.